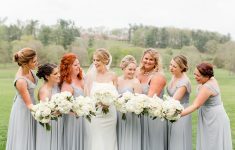 The team at Wedding Concepts constantly astound me with their creative, trend setting ideas and new ways of looking at wedding decor. 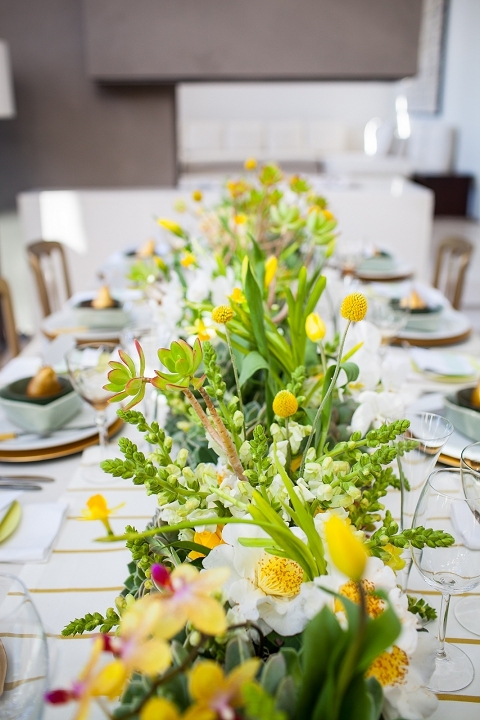 In between planning and designing some of South Africa’s most stylish weddings, they found the time to create this stunning yellow and mint inspiration shoot, photographed by Tasha Seccombe. 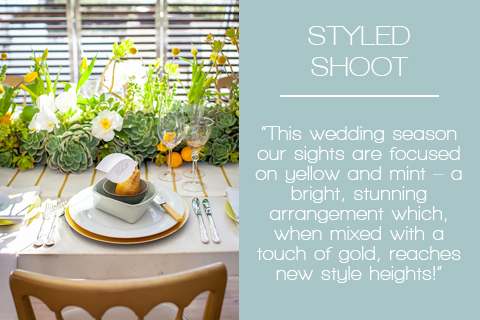 The palette combines the freshest spring colours with glamorous touches, and incredible attention to detail, it’s like a recipe card for the perfect spring celebration! It’s chic and trendy, modern and pretty yet with a delicate rustic touch maintains an elegant down to earth feel. 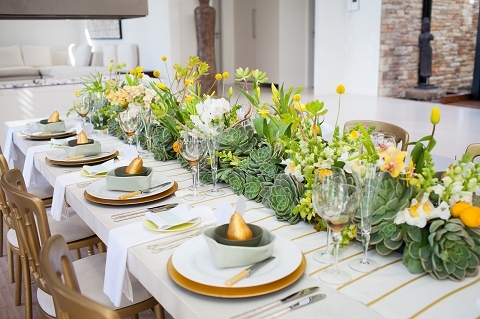 Oh how I wish every wedding table could boast an amazing floral table runner, gold painted pears, succulents and billy balls! 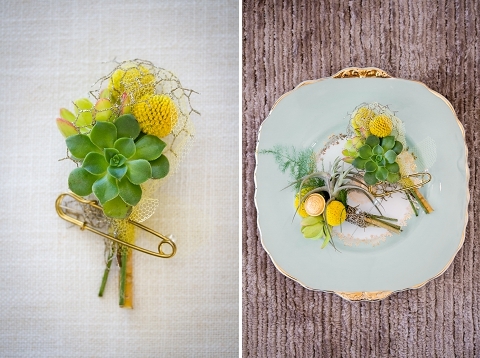 But if you’re budget doesn’t stretch quite that far, remember a styled shoot is designed to give you inspiration, so whether you discover a new favourite in succulents, adore the yellow & mint palette, find fruit place settings utterly delicious or adore all the little details from drinks flags to antique cutlery, incorporate these small elements into your day rather than trying to recreate the whole look. Every year, spring reminds us all that it is time for new beginnings and renewed happiness, and what better way to share this glorious mood than with colour – and lots of it! Our table set-up was simple yet striking – we discarded vases and floral containers in favour of a lush bush of flowers running down the middle to emphasise the notion of organic growth. We had a creative and design vision, to keep the centrepiece interesting, we used different types of flowers at varying heights. 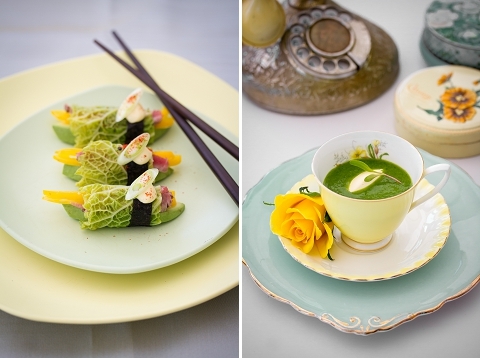 We wanted the place settings to be timeless and chic, so combined contemporary crockery with vintage pieces and gold accents. 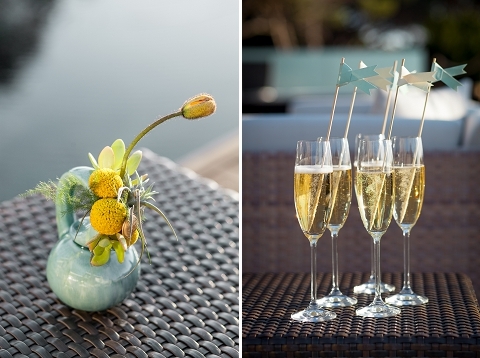 As we were creating a celebration that celebrates the season, spring flowers were very important. 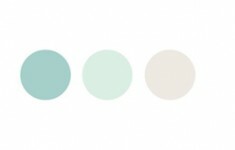 The mint colour was enhanced by using desert succulents. These gave the effect of a continuous garden from which spring flowers “erupted”. 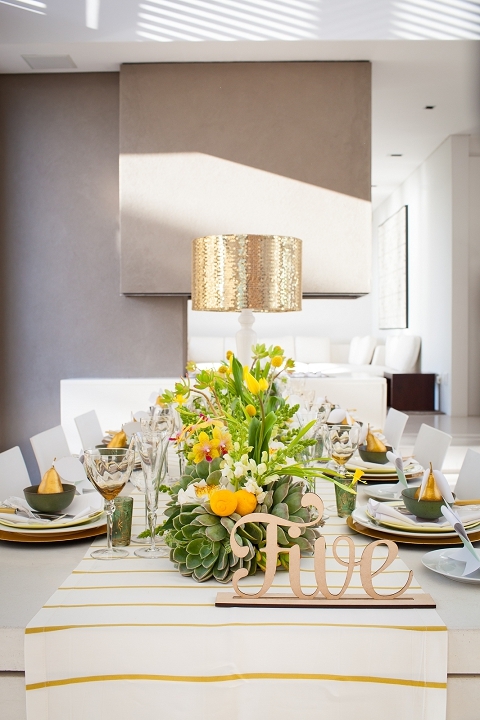 For the yellow and white tulips and daffodils added playfulness to the look. Miniature orchids added a touch of elegance and yellow Billy’s Ball flowers for a fun twist. 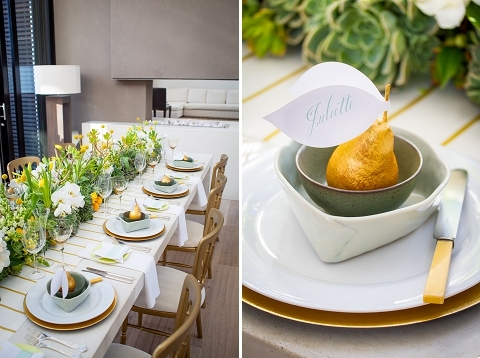 We wanted guests to embrace the occasion without feeling overwhelmed by too much detail. 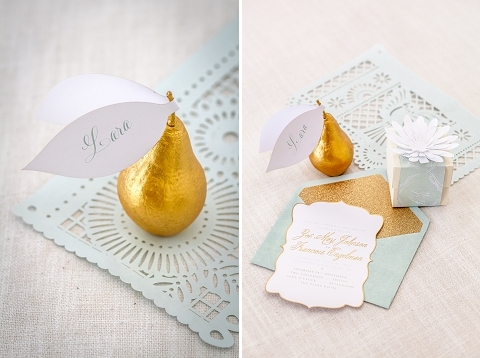 The stationery was given a glamorous “Fifth Avenue” theme given the natural appearance of the décor and food. 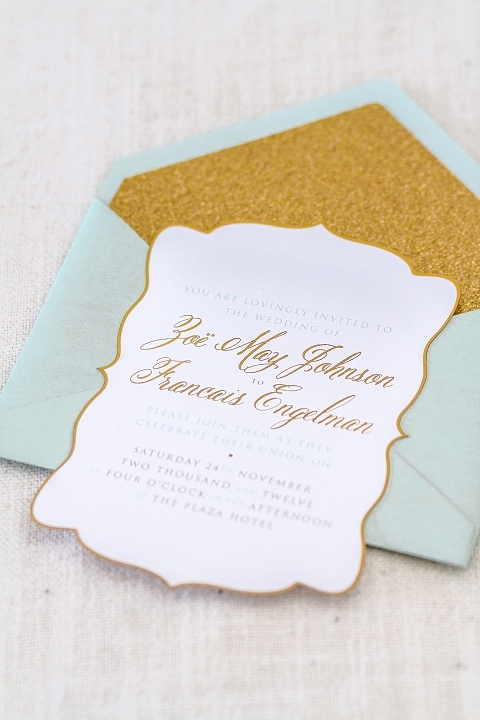 The stationery drew inspiration from summertime party dresses in metallic shades and muted jade and yellow tones. We wanted the overall look of the stationery to be sophisticated, but also have an element of whimsy to it. We also used laser cutting and a few clever folding techniques for the cocktail flags. 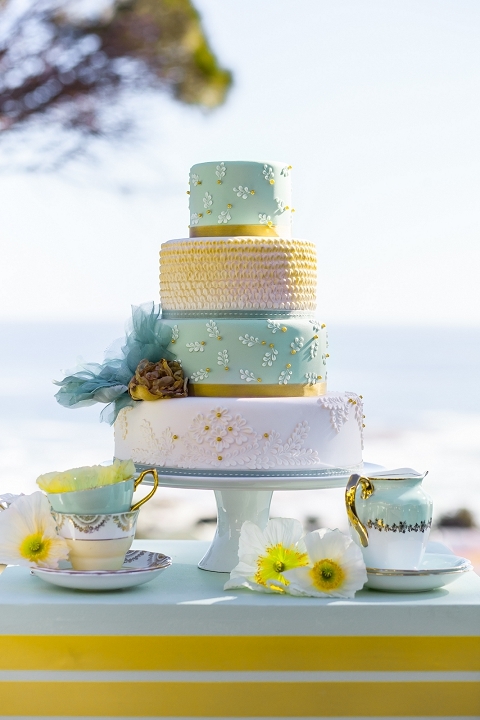 The wedding cake is fun and youthful with soft romantic touches. 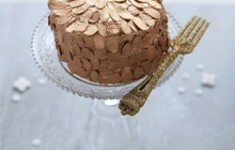 Keep it simple, with an element of surprise in the presentation and display. Thanks so much for sharing your creativity and inspirations with us! 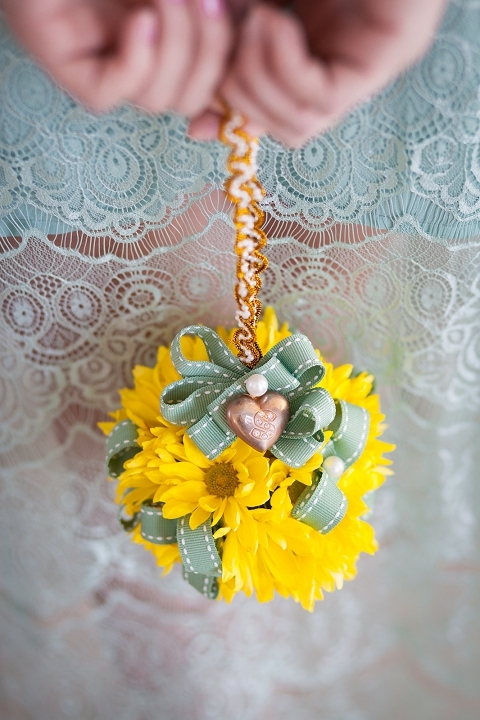 What ideas will you take away to recreate for your wedding?! 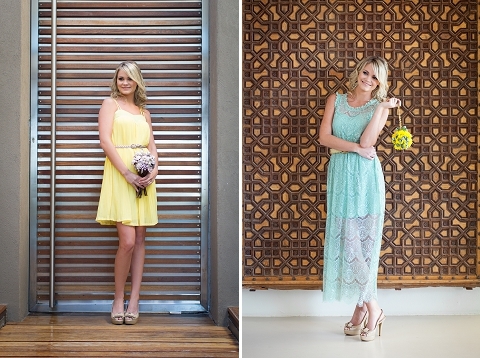 Our South African readers can see the full shoot and suppliers in the latest issue of Wedding Inspirations Magazine.